Have you heard of Operation Shower? If not, it is such a great organization! Operation Shower is about celebrating and honoring military families. Operation Shower provides baby showers for military families to ease the burden of deployment. Shindig Parties To Go has some wonderful FREE printables in support of Operation Shower! Some of the items included are cupcake toppers, bunny silhouettes, cross silhouettes, water bottle wraps, napkin wraps, tent cards, favor tags, candy bar wrappers, Easter signs, flags, a banner and more! What a great deal!!! You can download the free printables here but please make sure to also donate to Operation Shower here! I hosted an Egg Hunt this week and was excited to use some of the free printables. I wish I could take credit for these amazing cookies but my talented friend made all of these! Thank you, Shelley! 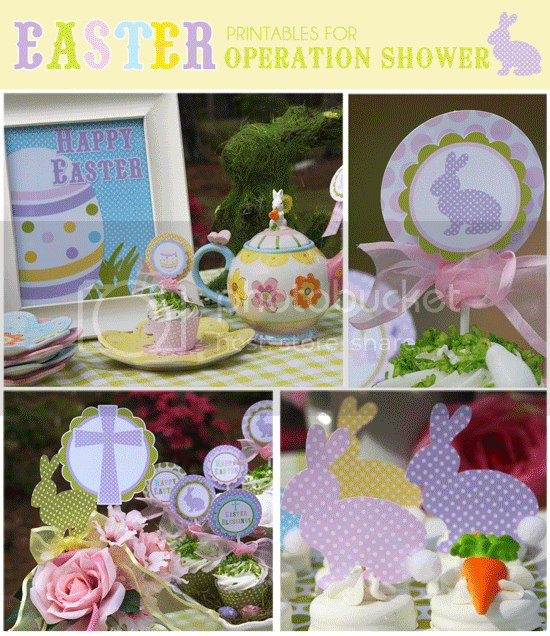 What a wonderful surprise to see my Easter printables for Operation Shower here!